At the entrance of Chinmaya Vibhooti stands guard Chinmaya Maruti. Chinmaya Vibhooti is a monumental tribute to the life, teachings and service of Pujya Gurudev Swami Chinmayananda. 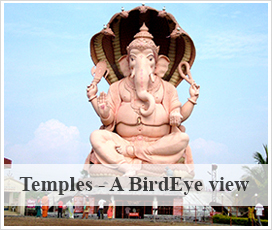 The Chinmaya Maruti Mandir is made of pink Bansipur stone and has some intricate carvings on its walls. 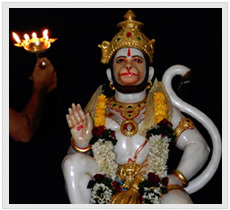 The idol of Lord Hanuman is made of white marble. Every morning the sun's first rays fall on the ever-radiant face of this ideal Sevak. The murti was consecrated on 24th December 2005 in the august presence of Swami Purushottamananda, Swami Tejomayananda and Swami Brahmananda. The inauguration of Chinmaya Vibhooti was on 25th December and it was well attended by a gathering of over 2000 devotees.